A significant portion of the general population is negatively affected by primary tinnitus. The novel treatment acoustic CR neuromodulation was demonstrated to induce a long-lasting reduction of tinnitus symptoms in recent studies. In a retrospective review of patient records including 134 chronic tinnitus patients and 19 controls, tinnitus questionnaire and visual analogue scales for loudness/annoyance are used to evaluate the safety and efficacy of acoustic coordinated reset neuromodulation. 92/56 patients completed the last 12/18-month visit, respectively. Acoustic coordinated reset neuromodulation therapy was demonstrated to induce a statistically and clinically significant decrease in tinnitus questionnaire scores along with tinnitus loudness and annoyance. There were no persistent adverse events reported that were related to the therapy. The results are in line with results from other studies using acoustic CR neuromodulation. This retrospective review of patient records provides further evidence for safety and efficacy of acoustic coordinated reset neuromodulation. Chronic tinnitus is one of the most frequently diagnosed conditions within the spectrum of otorhinolaryngological diseases. With approximately 150 - 200,000 patients being severely affected in Germany each year, the condition is a pertinent factor in the field of health economics [1,2]. With regard to pathophysiology, both neurophysiological research and the progress made in imaging techniques in recent years indicate that one of the main factors in causing and prolonging chronic tinnitus is the imbalance of excitatory and inhibitory neural networks in the central auditory pathway [3-5]. Furthermore, EEG and MEG studies have demonstrated that the limbic system, the “emotional brain”, and the reticular formation contribute to the levels of suffering experienced by tinnitus patients [6-9]. Against this backdrop, it may be helpful to refer to the Jastreboff or Kröner-Herwig model [10-12]. The fact that the limbic system plays a role in tinnitus may explain the high number of psychological co-morbidities occurring in tinnitus patients from severity level III to IV, as indicated by Goebel and Hesse [13,14]. Jastreboff's Tinnitus Retraining Therapy (TRT) has been offered by many German clinics over the past two decades, with therapeutic methodologies becoming diverse and more advanced [10,15-19]. Yet in recent years, various forms of acoustic neuromodulation have been developed for the treatment of chronic tinnitus. For example, the notched noise music therapy concept, devised by Pantev, et al., , which is intended to impede tinnitus perception, via lateral inhibition, through acoustic stimulation with notched music. Recent clinical results showed only limited effects using this method. Another concept that strives to target the patient tinnitus perception is the Heidelberger’s interdisciplinary model, known as “Music Therapy”, which selectively enhances certain frequencies in order to reduce patient awareness of the tinnitus percept [21,22]. Other methods of neuromodulation which work by stimulating the vagus nerve and use other diverse sites are still largely in the experimental stages . Another form of neuromodulation was developed by scientists at the Jülich research centre and has been tested in clinical studies. This method is based on long-standing theoretical and clinical research [24-27]. The method involves stimulation using sounds which are adapted to the patient’s individual tinnitus frequency and which follow a certain time sequence. According to clinical studies [27-29], the synchronous and hyperactive cortical neuron populations, which are a key factor in causing and prolonging tinnitus, can be down regulated to a normative state by presenting repetitive low-amplitude, pulse sequenced, acoustic stimulation such as that used in acoustic Coordinated Reset (CR) therapy. This type of treatment makes use of neural plasticity in order to engineer therapeutic changes in pathologically up regulated neural synchrony [27-29]. This is depicted in figure 1. In parallel to the development and certification (class IIa) of an applicable medical device, the T30 CR Sound Therapy Device, 63 patients with chronic, tonal tinnitus took part in a randomised, single-blind proof-of-concept study . During this study, patients underwent daily acoustic CR neuromodulation for 4-6 hours, demonstrating a high and sustained response rate after just 12 weeks. Furthermore, it was possible to detect significant changes in EEG results (decrease in δ and γ activity as α activity increases) after patients had undergone treatment for 12 weeks [27-29]. A recently published prospective clinical study (an open-label multi-centre study involving 200 patients with chronic, tonal tinnitus and being performed over a 12-month period) reported a clinically and statistically significant decrease of 38% in the suffering caused by tinnitus after patients had undergone acoustic CR neuromodulation . Williams et al., reported and published similar findings for a study carried out with 66 patients at a specialist tinnitus clinic in London, UK . Wegger et al., published a review of acoustic CR Neuromodulation in 2017 . Within this article the Danish authors described the available studies utilizing acoustic CR Neuromodulation in detail and came to the conclusion, that acoustic CR neuromodulation was safe and well tolerated and most patients reported reduction of tinnitus symptoms and that the level of evidence suggests that acoustic CR neuromodulation may have positive effects on tinnitus symptoms. Nevertheless, it is unclear to the authors of this article what framework was used by Wegger, et al., to finally come to the conclusion that the available evidence is insufficient for clinical implementation of acoustic CR neuromodulation . This is even more irritating, since the second and third author recommended other tinnitus treatments for clinical use after corresponding reviews with the outcome of no or small effects, or in case of insufficient or inconclusive study outcomes . The below presented results of such a clinical implementation of acoustic CR Neuromodulation might be useful to further discuss the practicability of this method in a normal clinical practice. Presently, a specialist ENT clinic will present their findings from a retrospective review of patient records including lasting 18-months and involving patients with chronic, tonal tinnitus which had not been improved by prior treatment. During this period, acoustic CR neuromodulation was carried out using the T30 CR Sound Therapy Device (ANM GmbH). 134 chronic tinnitus patients and 19 control were included in the retrospective review of patient records including between 2010 and 2012 in a specialized center run by ENT specialist located in Munich, Germany. Inclusion criteria were symptomatic primary tonal chronic tinnitus (≥ 3 months), < 60 dB hearing loss for all tested frequencies (125 Hz-8 kHz), and men and women ≥ 18 years old. Patients were not included in the review if they were found to be suffering from serious neurologic, psychiatric, or otological disease, objective tinnitus (e.g., tinnitus caused by muscle movements, vascular noise, and other somatosounds), Meniere’s disease and tinnitus triggered by craniomandibular disorders. The mean age of the tested population was 55.4 years and subjects suffered from tinnitus on average for 10 years. Approximately 25% of patients fit into these criteria for acoustic CR neuromodulation. Between 2010 and 2012, 134 patients opted to be treated with acoustic CR neuromodulation. During the initial set-up of the T30 CR Sound Therapy Device 4 tones were calculated in accordance with the patient’s recorded tinnitus frequency and were set at the same perceptual volume level, i.e., tones were perceived equally loud and were set to be just above threshold. The patient was also provided with detailed instructions and information relating to the device usage. Check-ups were performed at varying intervals: At one-month intervals at the beginning of the treatment, then every 6 weeks from the 2nd to 4th quarter and finally every 3 months after one year of participation. During these check-ups, doctors performed an examination and recalibration of the T30 CR Sound Therapy Device depending on the patient’s most recently recorded tinnitus frequency - an obvious change in pitch was noted in most patients when they were treated with this type of neuromodulation. Psychoacoustic and audiological check-ups took place every 3 months. Patients used the sound therapy device for 4 hours every day. The length of the treatment depended on the patient’s individual therapeutic process, however, the therapy duration lasted for a minimum of 1 year for all subjects. Besides extensive counselling sessions given to the patient at the beginning of the treatment and during check-ups, no further psychological care was explicitly provided and no other type of therapy was used throughout the duration of the application therapy. 19 patients were utilised as a control group. These patients were taken from a pool of tinnitus patients that showed up in the clinic for regular follow up visits without receiving a particular therapy (waiting list control group). The patients who were part of this waiting list control group filled out the tinnitus questionnaire at the beginning of the control phase, after 3 months and after 12 months to provide data points that allow a reasonable comparison with the treatment group. Missed data points (2 out of 57 all for the 3 month assessment) were filled using the last observation carried forward method. The age and gender distribution of the patients in the control group did not differ significantly from that of the user group. At the beginning of the assessment, the suffering caused by tinnitus was around 19.8% lower for patients in the wait list control group in comparison to the treatment group (as measured using a tinnitus questionnaire: 31.1 (11.2) points, compared with an average of 38.8 (16.4) points in the treatment group). This was taken into consideration when producing the statistics. Visual Analogue Scales (VAS) were used to assess the loudness and the annoyance of the tinnitus. The Tinnitus Questionnaire (TF), as per Göbel and Hiller, which is the German version of Hallam’s TQ , was further used to evaluate the patient’s suffering. The same categorisations as those employed in other publications were also used in this review: if the patient’s symptoms changed by one entire level of severity, corresponding to a 15-point reduction in the results from the tinnitus questionnaire by Göbel and Hiller, this was classified as a success (“winner”), with a reduction of 6-14 points being classified as an improvement (“responder”). If the patient experienced a change between -5 and +5 points, the symptoms were classified as unvarying (“non-responder”) and if the points increased by 6 and more, this was classified as a deterioration (“loser”) [35-38]. The raw data were submitted to the Institute for Statistics, Ludwig Maximilian University Munich, Germany, for statistical analysis. The statistical methods used included classic linear models for short-term and long-term changes. Furthermore, t-tests were performed and mean values and standard deviations were calculated. Out of the 134 patients, 11 dropped out over the 18-month usage period (relocation, change of doctor, failing to attend check-ups on multiple occasions). A further 31 patients chose to give the sound therapy device back after 3 months and received reimbursement of most of the expenses, an option offered to the patients by the sales company ANM GmbH. Therefore, data from 123 patients were included in the statistical comparison of baseline values (T0) to the values recorded after 3 months of treatment (T3): this took place as, from a statistical and methodical perspective, data from patients who have withdrawn should still be considered (“intention to treat” analysis), missing data points were added using the “last observation carried forward” principle, which was necessary for two data points for the 3 months assessment. For the analysis of longer treatment effects these 31 patient (who gave back their device after 3 months) weren’t considered. After 12-18 months of neurostimulation therapy, data from 92 patients was available for analysis. Details regarding the age of these patients, as well as the length of time they had suffered from tinnitus, are outlined in figure 2. The gender ratio of men to women was 2 to 1. In the treatment group, a baseline value was established for the average of 38.8 (16.4) points resulting from the TQ. This reduced to 33.3 (16.5) points (p < 0.01, taking into account the patients who withdrew from the review, of which a high percentage were non-responders) after 3 months of treatment and to 30.9 (17.6) points (p < 0.01) after 6 months of treatment. After 12 months of treatment, doctors were able to observe a decrease to a value of 28.4 (18.4) points in the tinnitus questionnaire, meaning an average reduction of 26.6%. The changes recorded after 12 months of treatment are statistically significant (p < 0.01), too. For 56 subjects TQ scores - documenting induced potential long-term effects - were obtained after 18 months of treatment. An average value of 20.1 (13.2) points was recorded in the tinnitus questionnaire, meaning the percentage decrease within this sub-population of 56 subjects (baseline TQ score 36.4 (13.7)) was 44.8% (p < 0.01). In contrast, no statistically significant change was recorded for the control group in the tinnitus questionnaire within the monitoring period, where a baseline value of 31.1 (11.2) points was recorded in the tinnitus questionnaire, that changed to 31.8 (11.8) points after 12 months (p > 0.05). More in-depth details regarding the changes recorded can be found in figure 3. 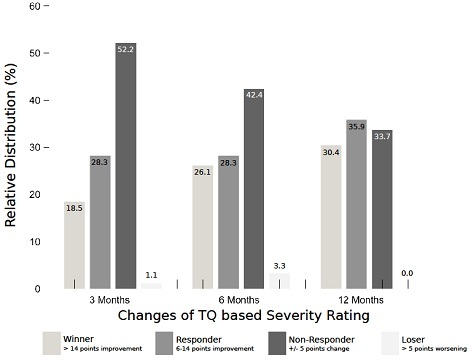 A clinically significant improvement (TQ improvement ≥ 6 points) in the tinnitus condition was recorded for 54.3% of patients in the treatment group after they had undergone 6 months of treatment with acoustic CR neuromodulation. Before starting this therapy, these patients were classified as “unresponsive to therapy” from the perspective of traditional medicine. After 12 months of treatment such clinically significant improvement (TF improvement ≥ 6 points) in the tinnitus condition was recorded for 66.3% of patients in the treatment group. 30.4% of the treated patients could be categorised as “winners”, 35.9% as “responders”, 33.7% as “non-responders” and 0.0% as “losers”. 12 of these 92 patients stated that they were no longer able to detect the presence of tinnitus after 12 months of treatment. An interim deterioration could be detected in a few patients, as shown in figure 3. 33.7% of patients were unresponsive to treatment. There was not a significant change in the tinnitus questionnaire score for the “non-responder” sub-group (according to the categories used in the tinnitus questionnaire): An average of 40.8 (16.2) points was recorded at the beginning of the treatment, with 40.1 (17.6) points (p > 0.05) being recorded after 12 months. The average reduction by a considerable 10.4 points (p < 0.01), as recorded in the TQ after 12 months of treatment with acoustic CR neuromodulation, is classified as clinically significant. These findings are comparable to the change in the tinnitus questionnaire as recorded during the RESET study . Namely, in the RESET study in the group 1 (4 hours/day of acoustic CR Neuromodulation) a TQ reduction by 12.4 points was observed, while in the too small placebo group (1 hour/day of placebo stimulation) the TQ reduction was 8.4 points after 12 weeks of therapy . Figure 4 depicts the distribution of patients according to levels of tinnitus severity, as per the tinnitus questionnaire by Göbel and Hiller. The initial distribution of patients according to levels of tinnitus severity corresponds to the way in which patients were categorised for the member survey conducted by the Deutsche Tinnitus-Liga (German Tinnitus Organization) [13,14]. During treatment with acoustic CR neuromodulation, levels of tinnitus severity became lower. After 12 months, the number of patients allocated to the category of severity level I doubled during treatment to 61.5% (baseline 30.8%); the number of patients in the severity level III and severity level IV categories reduced from 33.0% to 18.7% during treatment. The findings from the VAS scores are displayed in figure 5. The average tinnitus loudness was initially measured at 61.9 (16.5) points (out of a maximum of 100 points). Over a 12-month course of treatment, this figure decreased by 31.1% on average, to 44.0 (20.5) points (p < 0.01). These findings are in line with those from other studies on acoustic CR neuromodulation [27,30,31]. No significant change could be observed in the control group. There was no significant change in the tinnitus volume for the “non-responder” sub-group (according to the categories used in the tinnitus questionnaire): An average of 62.9 (15.3) points was recorded at the beginning of the treatment, with 59.2 (17.1) points (p > 0.05) being recorded after 12 months. Findings similar to those recorded for volume were also observed for the annoyance caused by tinnitus in the user group. The initial value of 61.0 (17.9) points fell to 42.1 (20.5) points, corresponding to a significant decrease of 31.0% (p < 0.01). The changes were significant for neither the control group, nor the non-responder sub-group. A decrease in tinnitus volume and annoyance could only be observed in patients who responded to treatment with acoustic CR neuromodulation. While being treated with acoustic CR neuromodulation, patients indicated a change in their tinnitus condition after just a few weeks, symptoms which had previously remained constant for years. For most patients, the frequency of their tinnitus become lower and the tinnitus volume decreased more often, whereby the frequency often changed by up to several octaves and remained so. An increase in the subjective tinnitus frequency was only detected in 12% of patients. In cases of high initial tinnitus frequency, the technical limits of the stimulator might be reached and it can be necessary to suspend treatment temporarily. It is not possible to deduce from literature whether this change in tinnitus frequency also occurs when patients are treated with other forms of acoustic neuromodulation. When evaluating a new therapy like the acoustic CR Neuromodulation (T30CR) the clinical results and improvements must be considered along side any potential side effects/risks. Tass et al., performed a study with 63 patients, whereby it was possible to observe a significant improvement in tinnitus symptoms (29%) after just 12 weeks of treatment, as per the results from a psychometric test . After undergoing treatment for a 6-month period, 58.8% of patients reported an improvement in their tinnitus symptoms, according to a UK based study . In a study entitled RESET REAL LIFE involving 200 patients, a significant improvement of 27.3% in the results of the TBF-12 test could be observed after 3 months of treatment and after 12 months of treatment, a reduction of 37.9% was recorded . After the patient group in this review had undergone 3 months of treatment, the values recorded in the questionnaire decreased by 14.2%. The “winners” rate was 18.5%, while the “responders” rate was 28.3%. The change was statistically significant after just 3 months of treatment (p < 0.01). At the end of the observation period for the control group, the values recorded from the tinnitus questionnaire, as well as the VAS data, had not changed significantly compared to the baseline values. The control group included fewer patients than the treatment group. Another interesting sub-group was the 30 patients who chose to return their stimulator within the first three months. For 8 out of these 30 patients, an improvement of 6 or more points in their tinnitus questionnaire values was observed whilst they were undergoing treatment. 12 months after ending their course of treatment, these patients completed a tinnitus questionnaire, either by telephone or post. Results demonstrated that there was no change to these patients’ questionnaire values, nor was there any relevant change in their tinnitus symptoms. The proportion of patients whose symptoms improved after receiving treatment increased as treatment is continued, as demonstrated in figure 3. Finally, these findings are in line with the findings of other studies, some open-label, some blinded [27,30,31,39]. To date, it has not been possible to identify the reason why it took longer for patients participating in this current review to respond to acoustic CR neuromodulation. Double-blind studies are particularly suitable, and also necessary, in order to evaluate new methods further. During the period of observation, a study of this kind was carried out in England (RESET2, NCT01541969); however, following an independent audit, the institution responsible for the study had to come to the unfortunate conclusion that the study was not applicable in a scientific context due to serious technical errors whilst it was being conducted . Namely, due to insufficient monitoring, training and insufficient adherence to manufacturer instructions significant errors in the pitch matching occurred leading to very coarse and basically incorrect pitch matching results. Since the pitch matching result is the essential parameter to configure the individual therapy tones of acoustic CR neuromodulation, it is not surprising that therapy effects were significantly diminished . Another randomized-controlled study was started in the USA (clinicaltrials.gov NCT03022084). Acoustic CR Neuromodulation is compared against Cognitive Behavioural Therapy (CBT) , the gold standard in tinnitus therapy in the USA. Designing acoustic placebo stimulation seems to be very difficult or impossible, since subjects might easily identify the placebo control, which would harm the integrity of such a trial. Therefore, a comparison against CBT sounds like a reasonable choice. Selecting the TQ as primary endpoint seems to be reasonable, since most studies on acoustic CR neuromodulation and CBT used this questionnaire as primary endpoint. Alternative questionnaires like the TFI might be more effective tools to show effects on tinnitus loudness and might therefore be a more effective choice for evaluating sound based therapies, but for a direct comparison a questionnaire, which might be in favour of CBT induced effects, will make this study more reliable. This study could add evidence to the effectiveness to the current discussion of this therapeutic method. Critics have alleged that the costs of treatment, for which the patients themselves are liable, might create expectations of positive results. A high percentage of patients have previously tried various methods with the associated, sometimes substantial, financial costs, without experiencing any improvement in their tinnitus symptoms. As demonstrated in figures 3-5 and as shown by the findings, 66.3% of the more than 100 patients who took part in this review, and who had suffered from tinnitus for > 5 years, experienced an improvement in their condition when treated with this new method. Such a response rate has never been achieved in our clinic by using other methods. It is not clear why 33.7% of patients in this review were “non-responders”. The author speculates that discrepancies between a change in tonotopy in the auditory cortex and auditory memory and the misstatement made on tinnitus frequencies for neuromodulation resulting from this may play a role; EEG examinations that are currently in process could be suitable for investigating this theory. 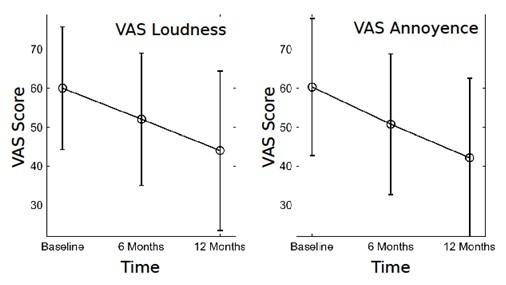 The VAS findings from this review are in line with other studies on acoustic CR treatment [27,30], for example, the findings that showed a 35% reduction in tinnitus loudness for “winner” and “responder” groups within one year. The reduction in VAS results is comparable to the changes observed when patients with chronic tinnitus are treated with other methods [16-18,23]. However, the change in tinnitus frequency that was observed for almost all “winners” and “responders” when treated with acoustic CR neuromodulation is particularly notable: After just a few weeks of treatment, reduced tinnitus frequencies were either reported or subjectively perceived by most of the patients. The physiological reasons for this remain unclear. They could perhaps be explained by prospective EEG, SPECT or MEG tests. Furthermore, it is possible to note that the effects of acoustic CR neuromodulation extend past the actual period during which the patient is subject to stimulation. That is to say, after the stimulation has been switched off, patients report that they continue to experience a reduction in their tinnitus. As such, all values were also measured after the acoustic CR neuromodulation had stopped, as in previous studies [27,30,31]. These long-lasting effects were also convincingly documented in the results of EEG studies [27,29]. All side effects that occurred whilst patients were undergoing acoustic CR neuromodulation with the T30 CR Sound Therapy Device were temporary and could be managed. Reported side effects included the sensation of pressure and headaches. These mostly occurred if the sound therapy had been used for too long (> 6 hours), or if the stimulation frequency settings were incorrect. Similarly, there were some instances of “acoustic hallucinations”. That is to say, after patients had used the stimulator for an extended period and then switched it off, they still had the feeling that they could hear the stimulating sounds for a short while after. In such instances, it helped to reduce the usage time. A more common problem was that patients perceived their tinnitus to be louder and more unpleasant after using the stimulator for a few weeks. It was impossible to verify this from an objective point of view (for example, an identical possibility of masking the tinnitus was observed in these instances). However, patients required special medical and psychological guidance for several weeks. As seen in figure 3, this meant that it was necessary to classify a small number of patients as “losers” on a provisional basis due to this temporary deterioration. Especially for patients with III and IV levels of tinnitus severity and a major psychological comorbidity (depression, anxiety disorders, etc. ), this potential period of deterioration, together with the anxieties resulting there from, can be very difficult to deal with as an outpatient. However, at any rate, all these patients experienced either a return of their tinnitus to their initial value, or even later an improvement in their tinnitus condition. No problems arose as a result of the technical operation of the T30 CR Sound Therapy Device. The patient compliance is very high for this type of treatment. After treatment with acoustic CR neuromodulation is completed, patients are monitored by means of random outpatient check-ups and tinnitus questionnaires etc. for a period of time between 2-3 years. Findings from these check-up appointments were consistent and no deterioration in patients’ tinnitus condition was recorded. In comparison to other similar procedures, the method itself had the lowest number of exclusion criteria: the only key limiting factors were, besides issues of cost, the approximate tonal nature of the patient’s tinnitus. Furthermore, for technical reasons acoustic CR Neuromodulation is actually only possible for tinnitus pitches from 0.4 to 10 kHz. In conclusion, it is necessary to conduct controlled, blinded studies in order to validate the method further within a scientific context; furthermore, there are still many outstanding issues which need to be investigated (e.g., what is the optimal usage period, can it be used during sleep, etc.). This retrospective review of patient records was performed over a 12-month period with a final total of 92 patients. The conclusion that can be drawn from this review is that acoustic CR neuromodulation using the T30 CR Sound Therapy Device can be used as another new therapeutic procedure to treat chronic tinnitus. There was an average reduction of 33.3% in Tinnitus Questionnaire score, an absolute, average reduction of more than 13 points; 2/3 of the patients reported being very satisfied with the outcome of their therapy outcome, which matches the 66.3% of patients who demonstrated clinically significant improvements of their chronic tinnitus symptoms (“winners” & “responders”). These results were obtained in a patient population that showed to be non-responsive to other therapies before and suffered from tinnitus for 10.0 years on average. Hannes Wurzer is an ENT doctor with a tinnitus clinic in Munich, Germany. He also is a consultant for Brook Henderson Group (DESYNCRA Technologies Limited) since 2014. Christian Hauptmann is employed by Desyncra Operating GmbH, Bad Neuenahr-Ahrweiler (part of Desyncra Technologies Ltd, London, UK). He worked with Juelich Research Center between 2002 and 2016, and has received research funding from the European Community, the Federal Ministry of Education and Research (Germany), the Deutsche Forschungsgemeinschaft, the Helmholtz Association. Eggermont JJ, Roberts LE (2004) The neuroscience of tinnitus. Trends Neurosci 27: 676-682. Langguth B (2012) Tinnitus: The end of therapeutic nihilism. Lancet 379: 1926-1928. De Ridder D, Vanneste S, Weisz N, Londero A, Schlee W, et al. (2013) An integrative model of auditory phantom perception: Tinnitus as a unified percept of interacting separable subnetworks. Neurosci Biobehav Rev 44: 16-32. Llinás R, Urbano FJ, Leznik E, Ramírez RR, van Marle HJ (2005) Rhythmic and dysrhythmic thalamocortical dynamics: GABA systems and the edge effect. Trends Neurosci 28: 325-333. Roberts LE, Eggermont JJ, Caspary DM, Shore SE, Melcher JR, et al. (2010) Ringing ears: The neuroscience of tinnitus. J Neurosci 30: 14972-14979. Weisz N, Moratti S, Meinzer M, Dohrmann K, Elbert T (2005) Tinnitus Perception and Distress Is Related to Abnormal Spontaneous Brain Activity as Measured by Magnetoencephalography. PLoS Med 2: 153. Song JJ, De Ridder D, Van de Heyning P, Vanneste S (2012) Mapping tinnitus-related brain activation: An activation-likelihood estimation metaanalysis of PET studies. J Nucl Med 53: 1550-1557. Dohrmann K, Elbert T, Schlee W, Weisz N (2007) Tuning the tinnitus percept by modification of synchronous brain activity. Restor Neurol Neurosci 25: 371-378. Adamchic I, Hauptmann C, Tass PA (2012) Changes of oscillatory activity in pitch processing network and related tinnitus relief induced by acoustic CR neuromodulation. Front Syst Neurosci 6: 18. Frenzel A (1997) Psychologische Behandlung des chronischen tinnitus. In: Kröner-Herwig B (Hrsg.). Beltz Verlag, Germany. Delb W, D’Amelio R, Archonti C, Schonecke O (Hrsg.) (2002) Tinnitus. Ein Manual zur Tinnitus-Retrainingtherapie bei chronischem Tinnitus. Göttingen, Hogrefe-Verlag. Jastreboff PJ, Hazell JWP (2004) Tinnitus retraining therapy. Cambridge University Press, Cambridge, United Kingdom. Goebel G (2010) Psychische Komorbidität bei Tinnitus. Psychiatrie und Psychotherapie. Hesse G (2008) Tinnitus. In: Hesse G (Hrsg.). Thieme Verlag, Stuttgart, Germany. Biesinger E (1999) Die Behandlung von Ohrgeräuschen. Biesinger E ( Hrsg.). Trias Verlag, Stuttgart, Germany. Goebel G, Kahl M, Arnold W, Fichter M (2006) 15-year prospective follow-up study of behavioral therapy in a large sample of inpatients with chronic tinnitus. Acta Otolaryngol Suppl 126: 70-79. Hesse G, Laubert A (2001) Tinnitus-Retraining-Therapie Indikation und Behandlungsziele. HNO 49: 764-779. Delb W, D’Amelio R, Boisten CJ, Plinkert PK (2002) Kombinierte Anwendung von Tinnitusretrainingtherapie (TRT) und Gruppenverhaltenstherapie. HNO 50: 997-1004. Jastreboff PJ (2007) Tinnitus retraining therapy. Prog Brain Res 166: 415-423. Pantev C, Okamoto H, Teismann H (2012) Music-induced cortical plasticity and lateral inhibition in the human auditory cortex as foundations for tonal tinnitus treatment. Front Syst Neurosci 6: 50. Cramer A (2002) Tinnitus: Wirksame Selbsthilfe mit Musiktherapie. In: Cramer A ( Hrsg.). Trias Verlag. Stuttgart, Germany. Argstatter H, Krick C, Bolay HV (2009) Musiktherapie bei chronisch-tonalem Tinnitus. Psychotherapeut 54: 17-26. Hesse G (2014) Referat: New trends of tinnitus therapy; Abstrakt-Band XIV Int. Tinnitus Kongress Berlin, Germany. Tass PA (2003) A model of desynchronizing deep brain stimulation with a demand-controlled coordinated reset of neural subpopulations. Biol Cybern 89: 81-88. Tass PA (2010) Verlernen krankhafter Synchronisation mittels desynchronisierender Hirnstimulation. In Schiepek G ( Hrsg.). Neurobiologie der Psychotherapie. Schattauer Verlag, Germany, Pg no: 607-618. Tass PA, Popovych OV (2012) Unlearning tinnitus-related cerebral synchrony with acoustic coordinated reset stimulation: Theoretical concept and modelling. Biol Cybern 106: 27-36. Tass PA, Adamchic I, Freund HJ, von Stackelberg T, Hauptmann C (2012) Counteracting tinnitus by acoustic coordinated reset neuromodulation. Restor. Restor Neurol Neurosci 30: 137-159. Silchenko AN, Adamchic I, Hauptmann C, Tass PA (2013) Impact of acoustic coordinated reset neuromodulation on effective connectivity in a neural network of phantom sound. Neuroimage 77: 133-147. Adamchic I, Toth T, Hauptmann C, Tass PA (2014) Reversing pathologically increased EEG power by acoustic coordinated reset neuromodulation. Hum Brain Mapp 35: 2099-2118. Hauptmann C, Stroebel A, Williams M, Patel N, Wurzer H, et al. (2015) Acoustic Coordinated Reset Neuromodulation in a Real Life Patient Population with Chronic Tonal Tinnitus. Biomed Res Int 569052. Williams M, Hauptmann C, Patel N (2015) Acoustic CR Neuromodulation Therapy for Subjective Tonal Tinnitus: A Review of Clinical Outcomes in an Independent Audiology Practice Setting. Front Neurol 6: 54. Wegger M, Ovesen T, Larsen DG (2017) Acoustic Coordinated Reset Neuromodulation: A Systematic Review of a Novel Therapy for Tinnitus. Front Neurol 8: 36. Larsen DG, Ovesen T (2014) Udredning og behandling af tinnitus. Ugeskr Læger 176: V04140242. Biesinger E, Reißhauer A, Mazurek B (2008) Die Rolle der Halswirbelsäule und des Kiefergelenks bei Tinnitus. HNO 56: 673-677. Goebel G, Büttner U (2004) Grundlagen zu Tinnitus: Diagnostik und Therapie. psychoneuro 30: 322-329. Lenarz T (2001) Probleme der Diagnostik und Therapie des chronischen Tinnitus. In: Goebel G ( Hrsg.). Ohrgeräusche. Urban & Vogel, Munich, Germany, Pg no: 17-32. Hallam RS (1996) TQ: Manual of the Tinnitus Questionnaire. Psychological Corporation, London, UK. Wurzer H (2011) First treatment experience with acoustic CR Neuromodulation Poster 40, 5th Int. TRI Tinnitus Conference, Buffalo, USA. Haller M, Hall D (2017) Evaluation of the Acoustic Coordinated Reset (CR®) Neuromodulation Therapy for Tinnitus: Update on Findings and Conclusions. Front Psychol 8:1893. Cima RF, Maes IH, Joore MA, Scheyen DJ, El Refaie A, et al. (2012) Specialised treatment based on cognitive behaviour therapy versus usual care for tinnitus: A randomised controlled trial. Lancet 379: 1951-1959. Figure 1: A graphic to depict the functionality of the neuromodulation used in acoustic CR. Figure 2: Distribution of the tinnitus duration in years (left) and age distribution at treatment start (right). Figure 3: Tinnitus Questionnaire (TQ) based severity rating in the course of the treatment. Figure 4: TQ severity rating. Figure 5: Visual Analogue Scores (VAS) for loudness and annoyance. Citation: Wurzer H, Hauptmann C (2018) Clinical Experiences with Acoustic CR Neuromodulation in Patients with Chronic Tinnitus. J Clin Stud Med Case Rep 5: 059. Copyright: © 2018 Wurzer H and Hauptmann C. This is an open-access article distributed under the terms of the Creative Commons Attribution License, which permits unrestricted use, distribution, and reproduction in any medium, provided the original author and source are credited.